Mother’s Day is lurking just around the corner. I am not even foolin. This past week I have been thinking a lot about my own dear Mother and all of the great things she has taught me over the years. Do you ever find yourself saying things to your own kids that your Mother used to say to you? It happens a lot at my house. Sure am glad mine had so many good things to say. Some of the things I have learned from my Mom are…. is important and smiled upon. makes your life full and wonderful. any place where it should be quiet and all normal people are acting sophisticated…. is a curse….and a curse we carry with a chuckle in our hearts. My apologies if I have offended any of you with my inappropriate chuckling. 4. Laughter is the best medicine. You can take it anywhere and it’s cheap, cheap, cheap. Laughing your guts out can really brighten up the day. 5. Show grace under pressure. 6. Be kind and good to everyone you meet. 7. Reading to your kids is a pleasure. 8. Reading a good book for yourself is a heavenly pleasure. 9. Cook up a meal every night for your family. 10. Let’s just all LOVE EACH OTHER. 11. Stand by your man. I wouldn’t be surprised if 90% of you have visited with her at the grocery store at some point in your life! I made these Lemon Cream Cheese Tarts this week with her in mind. Lemon Meringue Pie has always been one of her favorites….just hope I can get some of these tarts to her house before my kids scarf them up! 1. For the crust, put the flour, salt, sugar and shortening in your stand mixer and mix with the whisk attachment just until it starts to form a crumb like mixture. If you don’t have a stand mixer you can just put the ingredients in a bowl and mix with a fork, or pastry blender. 2. Turn the mixer on to low and add 5 T cold ice water. Don’t add any of the ice….just the cold water. I just fill up a bowl with water and ice and then measure out the 5 T.
3. Add one beaten egg. 4. Add 1 t vinegar. Mix the dough until all ingredients are combined. Don’t over mix here folks. Just get them combined and you are good to go. 5. Divide the dough into 4 pieces. Flour your counter top just a bit and then roll each section out. It helps to flour your rolling pin and your dough as well. You don’t want it to stick to the counter top. 6. 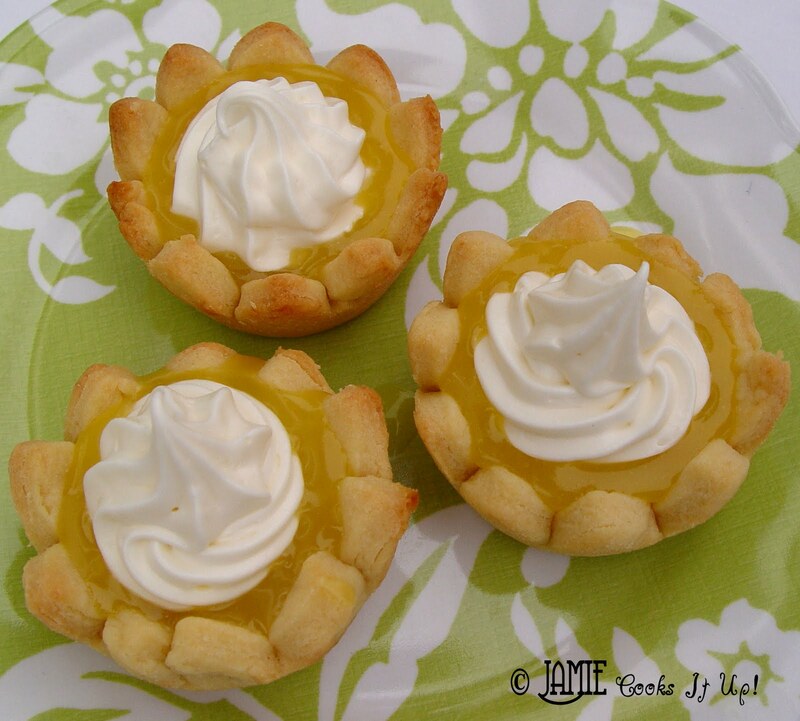 Cut out the tarts with a large star or flower cookie cutter. You could also use a large cup, or small bowl. 7. Gently place the cut out dough in regular sized muffin tins. Use a fork to poke some holes in the bottom of each shell. 8. Bake at 400 degrees for about 10 minutes. You don’t want them to get too brown. Keep and eye on them and take them out just when the tips of the shells start to turn a golden color. 9. Take the pans out of the oven and set them on cooling racks for about 10 minutes. Don’t remove the shells yet. They need time to sit and cool in the muffin tins. This will help them keep their lovely form. After the 10 minutes are up carefully take them out of the tins and let them continue to cool on the wire racks. 1. Zest your lemons and squeeze the juice. Set both of these aside. 2. In a sauce pan combine 3/4 C sugar, cornstarch and salt. Stir in the water and bring to a boil over medium heat. 3. Reduce the heat and add the remaining sugar. 4. Cook until the mixture is thick and bubbly. 5. Remove from the heat and stir in the butter, lemon peel, and food coloring. When these are combined gently stir in the lemon juice. Do not over mix. 6. Let the filling cool for about 10 minutes. Then pour into the pastry shells. Refrigerate for about 1 hour. 1. Beat your softened cream cheese and powdered sugar together. Add the cool whip and lemon juice and beat for another minute. 2. Pipe the topping onto the tarts and enjoy! 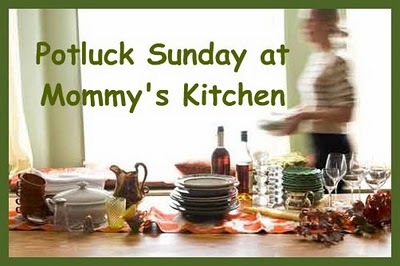 Check out Mommy’s Kitchen for more great recipes! oh yum. I love lemon pie so these look amazing. and your mom sounds like a fantastic person also. I'm sure she'll enjoy these tarts if they make it there. I always make my mom this amazing cheese cake for mothers day, it's a must I'm told now! Your mother does sound very special indeed! These tarts are perfect for her. They look fantastic. Great process photos! Thanks! The use of the star pastry cutouts really caught my attention. Very cute idea. Just found your blog from foodgawker – love it – will have to catch up on everything next week – but definitely will be making these tarts. I love the shape you used to cut the shells. They're very cute! very cute! I think I have a similar cookie cutter and never thought about using it to line my mini muffin pan…great idea!!! OMG omg!! This is so infectious.. I'm putting the computer right now and going into the kitchen..I'm not even kidding..I'm drooling like a dog seeing all the picture..This is one of my favorites. Wow, I love that you used a cookie cutter to cut out flower shapes for your tarts. I recently made lemon tart for a baking challenge and wish I had thought of this! I made these tonight for FHE. I wanted to lighten it up a bit so I used Phillo dough as the crust and I used fat free cream cheese and lite cool whip. The Phillo dough worked great, but the cream cheese and cool whip was not thick enough to pipe. I even added quite a bit more powdered sugar. I also don't think I cooked the filling long enough. It was pretty runny Jamie, how long does it usually take for the filling to thicken? Even with it runny my family still loved them. I plan on adding those to my make often list. I also might try making a key lime tart using this recipe. Thanks for your question. The filling should thicken up after about 3-4 of cooking, once the heat is reduced and the second 3/4 C of sugar is added (step 4). However it sets up very well after it's refrigerated (step 6). I'm glad your family liked them! Your sister Alli told me about your blog and I LOVE IT!! These are so pretty! I love lemon desserts. Thanks for posting the recipe! I am going to give these a whirl this mother's day…i think…i hope. i plan to anyway. i loved reading those things about your mom. she sounds so great! i can see why you are the way you are. you have taught me so many things, jamie. among them, is to just give people the benefit of the doubt. you mentioned that in your comment in RS today. i have long noticed how good you are at this. it's something i need to work on. what a great example you are to me. also, thanks goodness for your blog! when i got home from church today my daughter had pizza on the brain. homeade pizza to be exact. i love that with a few clicks i know i am sure to find a great recipe on your blog! thanks for all you do! Thanks for your sweet words. Made my day. PS…glad you found the pizza recipe you needed! What a unique way to make pie crust – I saw someone do that on Food Network last night. Now I'll have to try it! I love the look of your tarts, especially the cream cheese topping. I made these along with some other pastries for my sisters 20th wedding anniversary. They were fantastic. Thank you for sharing your recipes. Quick Question…how far in advance can I make the topping? I want to make it tomorrow for an event Saturday night? I have already made the pie crusts and are in the freezer and the lemon curd but I want the topping to stay nice and fluffy but I will not have the time to make right before…any suggestions? Wow! You are very prepared. This topping will keep well for several days. I would imagine it to be fine if you made it today. However, store it in a covered bowl rather than a piping bag. It may start to separate (because of the lemon juice) and you'll need to stir it before you pipe it onto your tarts. Good luck! Hope everything turns out well for you. Hi! I just noticed that the listed recipe calls for 1 1/2 cups of sugar in the lemon filling but the pictured directions says 3/4 of a cup. Please advise! Becky E.
OH My!!! These are soooo good !!! If you are a lemon lover you will love these. The dough turned out great and I wasn’t sure it was going to, it was easy too. Also the custard filling turned out great. The only issue I had was finding the right cookie cutter. I tried a star and that wasn’t big enough to fill a regular muffin pan ..as I was afraid the custard would run out. I liked the look of the ones in the picture but I used a scalloped edged round cutter, they turned out cute. It takes a little time to make the pastry cups, you know roll, cut, place in pan, bake, cool etc… But that’s what homemade is about, mine made 37. Very good thanks for sharing Jamie.